This essay appeared in the Plain Dealer’s “Her Say” spot in 1997, a few years after my mother-in-law’s death. A family friend just asked for a copy, and when I dug the old clipping out, it seemed like a good thing to recycle on this Christmas Day. I’d love to have you respond with memorable-gift stories (not necessarily for Christmas) of your own. Recently my husband purchased some new sweaters. Up to now, all his sweater needs were filled by his mother, who loved buying things and who thought a good-looking sweater made the perfect gift. Dee Ewing bought John and her three other children at least one sweater every single Christmas. 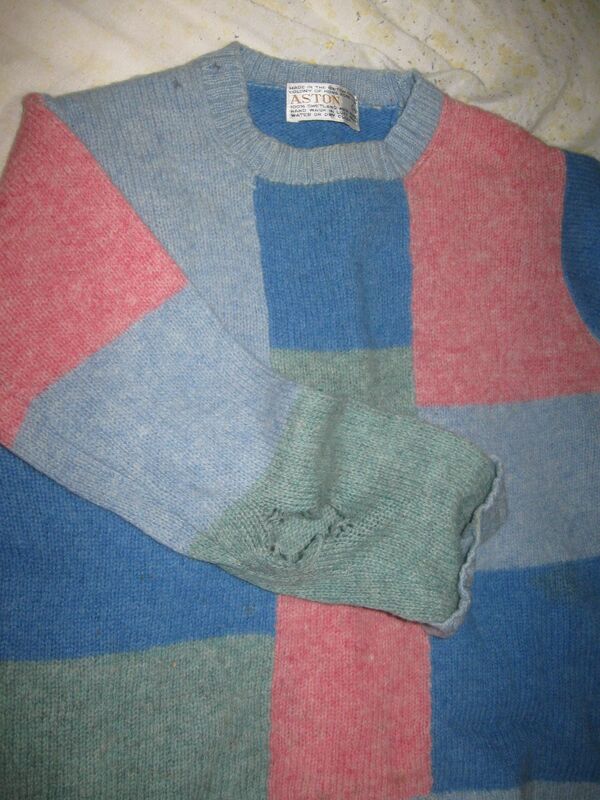 We daughters-in-law also received our ration of sweaters. Through my nineteen years of marriage, I have winnowed out the out-dated and the outgrown editions every so often to make room in my drawer for the new ones. Gone are the garish, the too-tight, and the monogrammed. This fall, I sorted through my sweaters once again in preparation for the holiday sweater-giving season. A particular well-worn sweater with stretched ribbing and torn elbows I returned to the drawer, as I had many times before. It’s a souvenir. This threadbare specimen dates from my first Christmas with the Ewing family, a couple of years before my marriage. John and I had been dating for awhile, but I hadn’t had the courtesy or common sense to get to know his parents. A post-60’s graduate student, I was in my late-hippie stage: long hair, frayed jeans, bad attitude. I slid in and out of the Ewings’ well-appointed home as unobtrusively as possible–too shy to initiate a conversation and too arrogant to realize my rudeness. A few weeks before that first Christmas, John asked me my size, because his mom wanted to buy me a present. I said she didn’t need to. I regarded that as challenge I couldn’t refuse, so I divulged my size and agreed to come for Christmas. I arrived at the Ewing home carrying a nondescript Christmas mug for my hostess. Sitting in the living room with John’s family, I marveled at the size of the tree, the abundance of gifts, and the mountians of discarded wrapping and ribbon. As the endless gift-opening proceeded, I watched the Ewing siblings and their spouses come upon their Christmas sweaters from Dee. Each one had a ’70’s-style patchwork design of varying colors. My mother-in-law-to-be brought me a large, beautifully wrapped box to open. 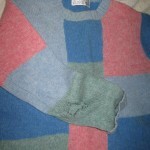 Inside I discovered a patchwork sweater like the ones she had given to her family. Mine had squares of pastel blues and pinks, and it fit fine. I wore it for years, until the ribbing stretched and the elbows frayed. This was just the beginning. Dee, I soon learned, would always arrive at our home laden with presents — sometimes a barely used Christmas decoration, sometimes a tin of cookies, sometimes t-shirts or toys she had picked up for the kids on vacation, and once an entire set of china. There were too many gifts, more than our house could hold, but all of the dishes, clothes, furniture, and knickknacks were outpourings of a generous spirit. A few years ago, on a Monday night just before Christmas, John’s brother called to tell us of Dee’s heart attack. Thus we lost the person who remembered everyone’s birthdays and anniversaries, who always came bearing gifts, and who filled her family’s every sweater need. But everywhere I turn in my house, from bookshelves to cupboards to closets, I’m reminded of a giver. Each time I glance at a catalogue or browse at the mall I’m reminded of a certain shopping addict who loved giving gifts. Every time we buy a sweater, I remember the gift that invited me to join a family. This was written by Kathy. Posted on Saturday, December 25, 2010, at 9:57 pm. Filed under Uncategorized. Bookmark the permalink. Follow comments here with the RSS feed. Post a comment or leave a trackback.